By Mark Havey: Espn.co.uk have stated that Tyson Fury (19-0, KO’s 14) is in talks concerning the prospect of a fight with Ruslan Chagaev (30-2-1, KO’s 19). Fury stated last month that he was going after Chagaev, who is currently without a trainer. Ruslan Chagaev become the WBA champion in 2007. He defended it twice before falling victim to Heavyweight king, Wladimir Klitschko. Chagaev has beaten John Ruiz and Nikolai Valuev so it could be a good win for Fury. But getting the win is easier said than done. Fury has had four easy fights in a row. He has become too comfortable. He could have shot himself in the foot. Chagaev has experience at the top, Fury doesn’t. I don’t really see what Ruslan Chagaev has to gain by facing Tyson Fury. There is a lot of risk and not too much reward. He is a former world champion and ex opponent of the current world champion. Chagaev has faced numerous world and ex world champions. Fury’s claim to fame is beating Dereck Chisora and being suggested as a future Klitschko opponent. 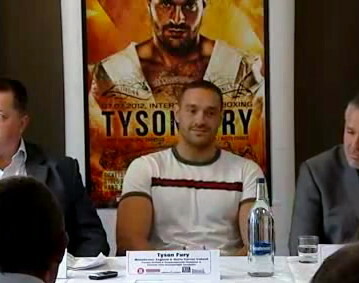 If Tyson Fury trains hard then the fight could be very good. He is 9 years younger than the former champion. If Fury loses it would be disastrous for this future.